One year ago - and near enough to the day, Paul van Dyk opened the singles account for his eighth studio album with ‘Everyone Needs Love’. What followed was a process of music release that’s been cathartic for the man himself. Now, 12 months on, he brings the release year for the album that MIXMAG hailed as “inspirational” and DJ Mag called “a love letter to the trance family” to the brightest possible conclusion. As his last single for 2017, Paul has selected ‘Escape Reality Tonight’. Musical escapism is the aim at the heart of all PvD’s work - a theme he looked to place in the foreground of ‘From The On’s penultimate recording. To assist in this pursuit, Paul teamed up with both Italian producer and VANDIT Records regular Emanuele Bravari and Singaporean Rebecca Louise Burch. For its single release ‘Escape Reality Tonight’ is now served by two different mixes. Aimed squarely at the heart of the trancefloor, the Original Album version is hooked around the cool but resolute drive of the PvD production engine. Through the zephyr-like float of Emanuele’s harmonies and Rebecca’s utopian-natured lyrics, the track assumes an almost dreamlike rapture. PvD’s The Great Escape Mix meanwhile provides the proverbial script flip. On it Paul draws down the production’s houselights and centres a spotlight on Rebecca’s vocal. As the drums and percussion fall away, the ether of its contextual FX and luminescent pianoforte serve as the platform for her song. 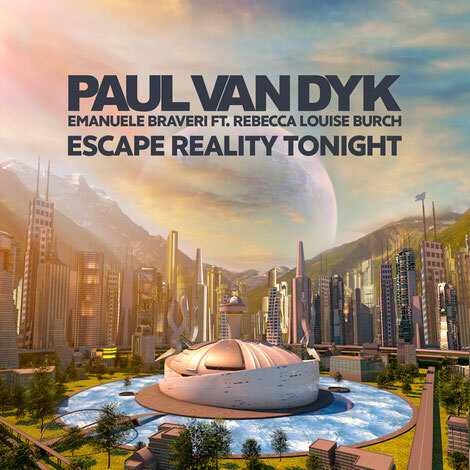 Paul van Dyk & Emanuele Braveri Ft. Rebecca Louise Burch ‘Escape Reality Tonight’ is out now on VANDIT.